In the worst incident so far, hundreds of police, dressed in riot gear, surrounded Occupy Oakland’s encampment and fired rubber bullets (which can be fatal), flash grenades, and tear-gas canisters – with some officers taking aim directly at demonstrators. The Occupy Oakland Twitter feed read like a report from Cairo’s Tahrir Square: “they are surrounding us”; “hundreds and hundreds of police”; “there are armored vehicles and Hummers.” There were 170 arrests. My own recent arrest, while obeying the terms of a permit and standing peacefully on a street in lower Manhattan, brought the reality of this crackdown close to home. America is waking up to what was built while it slept: private companies have hired away its police (JPMorgan Chase gave $4.6 million to the New York City Police Foundation); the federal Department of Homeland Security has given small municipal police forces military-grade weapons systems; citizens’ rights to freedom of speech and assembly have been stealthily undermined by opaque permit requirements. Suddenly, America looks like the rest of the furious, protesting, not-completely-free world. Indeed, most commentators have not fully grasped that a world war is occurring. But it is unlike any previous war in human history: for the first time, people around the world are not identifying and organizing themselves along national or religious lines, but rather in terms of a global consciousness and demands for a peaceful life, a sustainable future, economic justice, and basic democracy. Their enemy is a global “corporatocracy” that has purchased governments and legislatures, created its own armed enforcers, engaged in systemic economic fraud, and plundered treasuries and ecosystems. Around the world, peaceful protesters are being demonized for being disruptive. But democracy is disruptive. Martin Luther King, Jr., argued that peaceful disruption of “business as usual” is healthy, because it exposes buried injustice, which can then be addressed. 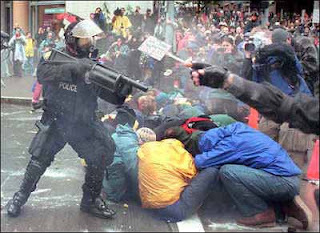 Protesters ideally should dedicate themselves to disciplined, nonviolent disruption in this spirit – especially disruption of traffic. This serves to keep provocateurs at bay, while highlighting the unjust militarization of the police response. Moreover, protest movements do not succeed in hours or days; they typically involve sitting down or “occupying” areas for the long hauls. That is one reason why protesters should raise their own money and hire their own lawyers. The corporatocracy is terrified that citizens will reclaim the rule of law. In every country, protesters should field an army of attorneys. Protesters should also make their own media, rather than relying on mainstream outlets to cover them. They should blog, tweet, write editorials and press releases, as well as log and document cases of police abuse (and the abusers). There are, unfortunately, many documented cases of violent provocateurs infiltrating demonstrations in places like Toronto, Pittsburgh, London, and Athens – people whom one Greek described to me as “known unknowns.” Provocateurs, too, need to be photographed and logged, which is why it is important not to cover one’s face while protesting. Protesters in democracies should create email lists locally, combine the lists nationally, and start registering voters. They should tell their representatives how many voters they have registered in each district – and they should organize to oust politicians who are brutal or repressive. And they should support those – as in Albany, New York, for instance, where police and the local prosecutor refused to crack down on protesters – who respect the rights to free speech and assembly. Many protesters insist in remaining leaderless, which is a mistake. A leader does not have to sit atop a hierarchy: a leader can be a simple representative. Protesters should elect representatives for a finite “term,” just like in any democracy, and train them to talk to the press and to negotiate with politicians. Protests should model the kind of civil society that their participants want to create. In lower Manhattan’s Zuccotti Park, for example, there is a library and a kitchen; food is donated; kids are invited to sleep over; and teach-ins are organized. Musicians should bring instruments, and the atmosphere should be joyful and positive. Protesters should clean up after themselves. The idea is to build a new city within the corrupt city, and to show that it reflects the majority of society, not a marginal, destructive fringe. After all, what is most profound about these protest movements is not their demands, but rather the nascent infrastructure of a common humanity. For decades, citizens have been told to keep their heads down – whether in a consumerist fantasy world or in poverty and drudgery – and leave leadership to the elites. Protest is transformative precisely because people emerge, encounter one another face-to-face, and, in re-learning the habits of freedom, build new institutions, relationships, and organizations. None of that cannot happen in an atmosphere of political and police violence against peaceful democratic protesters. As Bertolt Brecht famously asked, following the East German Communists’ brutal crackdown on protesting workers in June 1953, “Would it not be easier…for the government to dissolve the people and elect another?” Across America, and in too many other countries, supposedly democratic leaders seem to be taking Brecht’s ironic question all too seriously.